The lights are off, the tinsel's down, and it's time for your Christmas tree to leave the party. 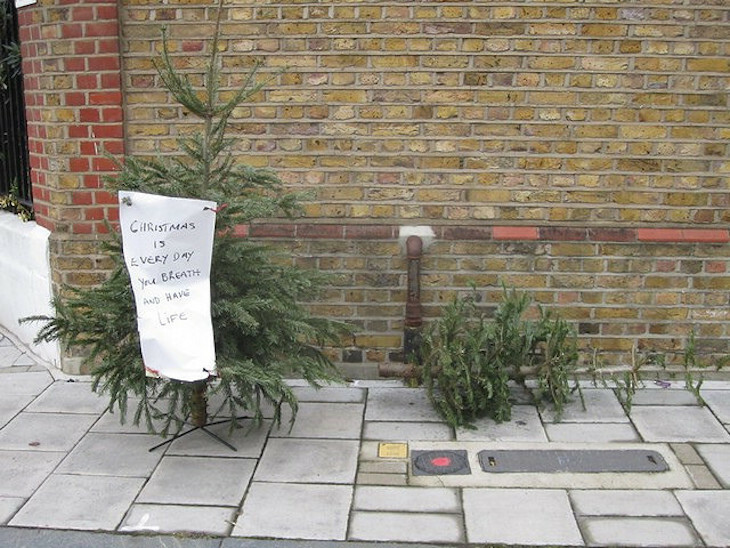 But where can you dispose of a Christmas tree in London? Here's a borough by borough guide. Barnet residents should leave their trees by their bin on collection day to have them taken away. As long as they have been broken in half, they should be accepted between 6 January to 3 February 2019. Otherwise, take your tree to the recycling centre on Summers Lane in North Finchley. Bexley doesn't seem to have made any provision for recycling Christmas trees this year — a readymade excuse to keep the party going all year. Brent residents signed up to the garden waste service can dispose of the tree in their green bin (looks like it'll have to be in the bin, rather than next to it, so start sharpening your saw now). Otherwise, there are 22 drop-off points open across the borough between 31 December 2018 and 13 January 2019. You can also just lug the beast down to the Reuse and Recycling Centre on Abbey Road, although be warned it's closed on Christmas Day (weird time to get rid of your Christmas tree, but you never know), Boxing Day and New Year's Day. If you're signed up to the green garden waste bin collection service, chop your tree up and pop it in there (again, it must be in the bin for it to be collected). Otherwise a number of temporary recycling centres where you can dispose of your tree will pop-up across the Bromley borough for the weekend of Saturday 5 and Sunday 6 January 2019 only. Better whip those decorations off quick. If you've already got a waste disposal permit, you can also offload your Christmas tree at the Waldo Road or Churchfields Road recycling centres. Camden is opening a number of Christmas tree recycling points across the borough from 2-14 January 2019. These range from local squares, to car parks, to garden centres. Find your nearest one on this handy Christmas Tree Recycling Point Map. If you've got a number of other bulky items to get rid of, it may be worth making the most of Camden's large household item collection. There's a charge, but they'll take up to a whopping 60 black bags' worth of rubbish. 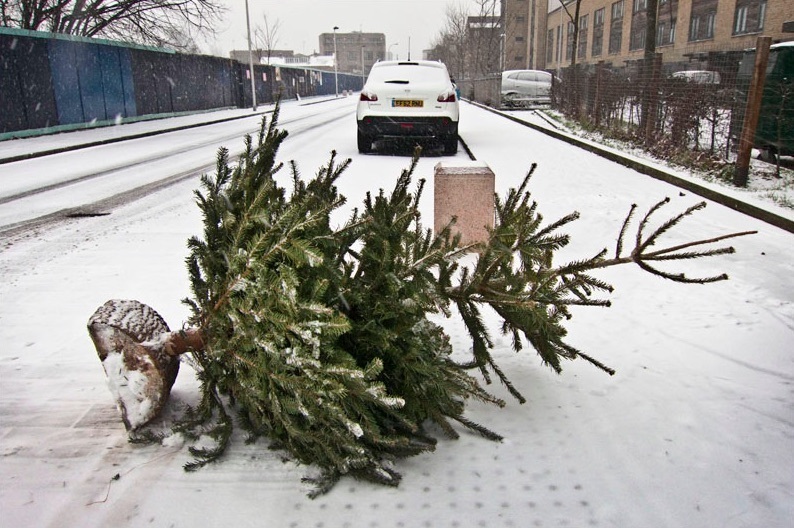 The City of London has said it will be operating a Christmas tree recycling service where residents can drop off their real trees at designated collection points. Details here. Croydon Council will once again be collecting trees from kerbside properties this year. Just leave it out next to your regular bin on refuse collection day between 14-25 January 2019. If you're not in a kerbside property, take the tree to one of Croydon's three reuse and recycling centres instead. Ealing residents can pop their tree out for collection with their black refuse bin between 2-25 January 2019. They're very specific and will not accept tree trunks which are more than 20cm in diameter or six foot in height. Chop it down if you're unsure. Otherwise, there are a bunch of pop-up collection points across the borough where you can offload your tree in its entirety right up until the end of January 2019. If you have a garden recycling collection, pop the tree out on collection day (chop it so it's shorter than 6ft or it won't be taken). There are also 13 drop-off points across the borough, open until 13 January 2019. After this date, take your tree to Barrowell Green Recycling Centre. No information has been released yet for this year, but in the past Greenwich borough has always whisked away residents' trees as part of their weekly bin collection. We imagine they'll do the same again, but keep your eyes peeled on the Greenwich Borough website just in case. Between 2-11 January 2019, Hackney Council will collect your tree on your normal rubbish and recycling day (leave it out the front if you're in a house, or next to the communal bins if you live in flats). Otherwise, take it to the Millfields Depot before 31 January 2019. Bonus fact: all trees get shredded and become compost to be used in Hackney parks and gardens. Between 2 and 15 January 2019, Hammersmith & Fulham will kindly collect your tree as part of your normal waste collection. Simply leave it out the front of the property on your collection day. There are also 10 designated drop-off points around the borough if you miss collection. If you receive green garden waste collection, chop your Christmas tree into pieces no more than 3 feet long and leave it out with that. Otherwise take it to the Haringey Recycling Centre in Wood Green, or one of the six drop-off sites in parks (only available for the four weeks after Christmas). There don't seem to be any specific collection arrangements in place in Harrow, but you can recycle your tree by dropping it off yourself at the Harrow Recycling Centre in Wealdstone. Note that this centre is for Harrow residents only, and you need to bring both photo id and a proof of address such as a utility bill. Good news: Havering residents previously were left to their own devices when getting rid of their Christmas trees, but no longer! This year, you can recycle the tree at Gidea Park Sports Ground in Romford on Saturday 5 January 2019, 10am-2pm. If that four-hour window doesn't suit, Gerpins Lane House and Recycling Centre will take it off your hands. Finally, if you're a garden waste customer, simply chop it up and chuck it in your garden waste bin. Christmas trees will be collected throughout January as part of residents' weekly garden waste collection — just cut it into pieces less than 2ft long and pop it next to your garden and food waste on a usual collection day. 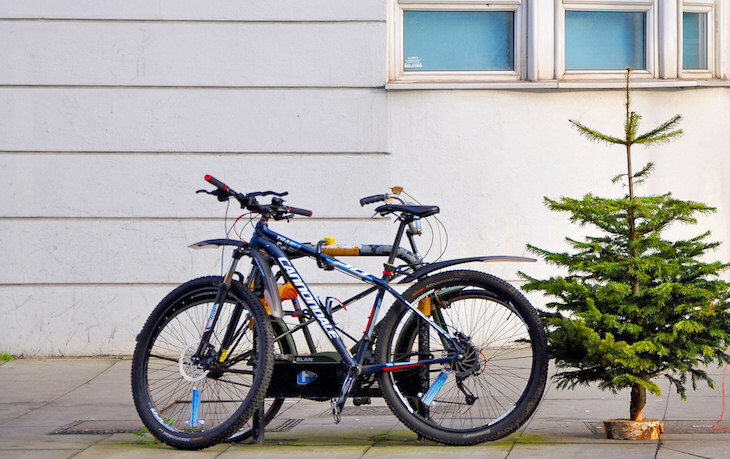 Flat-dwellers can also leave their trees out for collection from 7 January 2019, but you have to call the Hillingdon Contact Centre to let them know they need to pop by. Christmas trees will be collected by the council between Monday 7 and and Friday 18 January 2019, but do note that Christmas tree collection takes place on different days to other rubbish collections — more details on the London Borough of Hounslow website here. If you're a resident who doesn't receive the wheelie bin service, scroll to the bottom of the that page to see a number of collection points where you drop your tree off during January. Take your tree to one of the nine drop-off points between 1-20 January 2019 — or the Hornsey Street recycling centre accepts trees all year round. Trees will also be collected from your house after 2 January, your council estate on 12 and 19 January (check the exact location with your caretaker), or from your flat-above-a-shop from 6 January. Kensington & Chelsea residents are encouraged to take their trees to one of several drop-off points around the borough between 2-20 January 2019. Alternatively, the council will collect it from your house on your usual collection day, although make sure the tree is out the front by 7am or you may miss it. Leave your Christmas tree next to your black wheelie bin between 7-19 January 2019, and Kingston Council will take it away. Otherwise, the recycling centre off Villiers Road will take it off your hands at any time. Christmas tree collection hasn't been confirmed for 2018/19 by Lambeth Council, but they have run this service the last few years so fingers crossed it will be the same again. In the past, it has simply been a case of leaving your trees out the front on refuse and recycling days. Whatever the deal with collection this year, there are also a handful of collection centres that you can take your tree to. Drop your tree off at one of 11 locations across the borough throughout January 2019, or chop it up and pop it in your garden waste bin in pieces no bigger than 10cm thick and 50cm long (trees left out separately won't be collected). Put your tree out for collection before 6am on Monday 6 January 2019, and it'll be collected sometime between then and 17 January. Otherwise, take it down to the recycling centre in Morden. 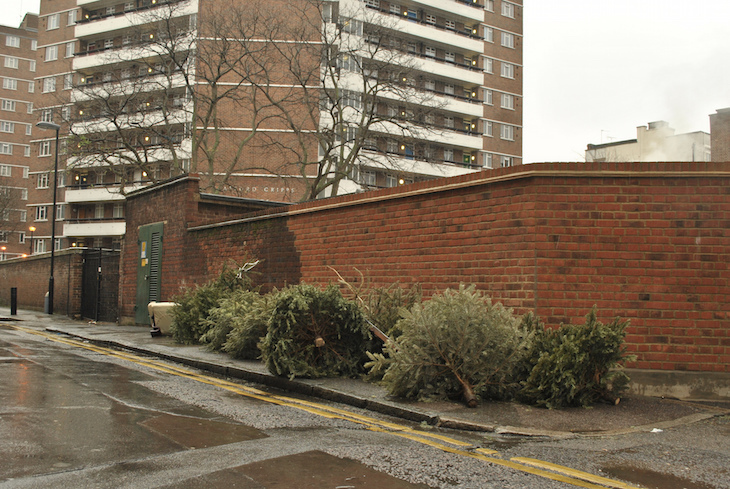 Newham hasn't made specific arrangements for Christmas trees, but will collect them as part of green garden waste collections, provided they are cut down to a manageable size. People who don't subscribe to this service can dispose of their trees at the Jenkins Lane recycling centre instead. 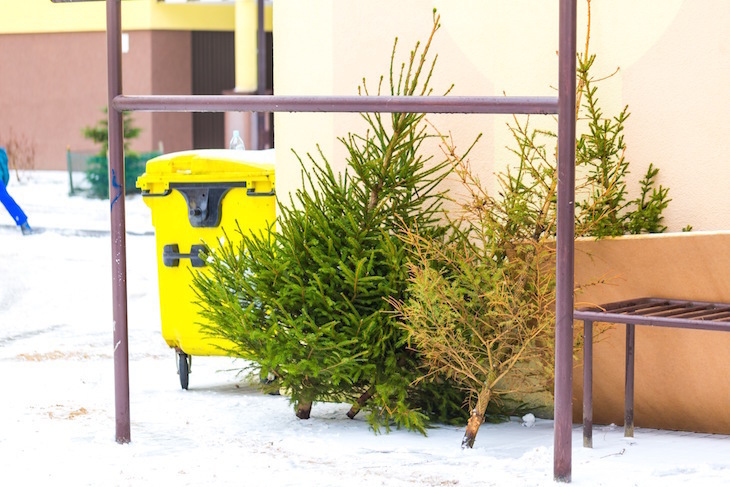 Redbridge residents should leave their Christmas trees out the front of their properties between 14-25 January 2019 — collection will take place sometime during those two weeks. Otherwise the Chigwell Road tip accepts garden waste. Richmond will collect your tree for recycling between 7-18 January 2019 on the normal garden waste collection day. 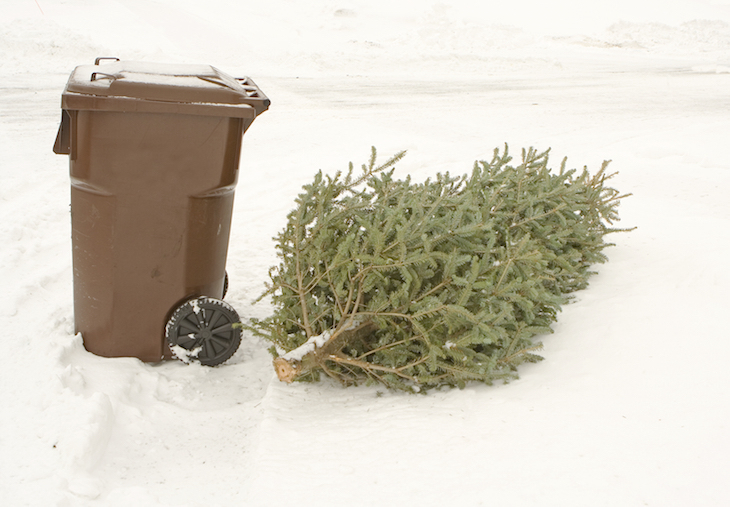 Note, you don't have to be a garden waste collection subscriber to have your tree collected. Or you can take it to one of the seven drop-off points across the borough from 2 January. Southwark is another council that usually collects Christmas trees left by bins on normal waste collection days in January, but they haven't yet confirmed the same for 2018/2019. So keep your eyes peeled on the council website, or simply dispose of your arboreal chum at the recycling centre on Devon Street instead — you'll need to show proof of residence. Sutton Council is collecting trees from 14-26 January 2019 — just place it outside next to your brown wheelie bin on collection day. Wanting to dispose of your tree earlier? Head to one of the three drop-off points between 5-13 January instead. Tower Hamlets residents who have a food and garden waste collection can leave the tree out as part of that between 7-21 January 2019. Those who do not have kerbside collection services should speak to their caretaker or management company, as there may be communal collection points nearby. Leave your tree next to your brown bin if you have kerbside organic collection, or take it to one of the three waste and recycling centres in Leyton, Chingford or Walthamstow. If your tree is excessive in size, arrange a separate large item collection with Waltham Forest Council. 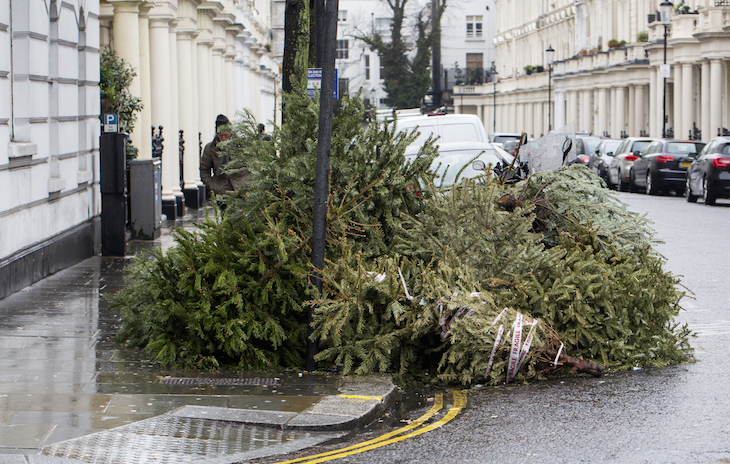 For two weeks in January, Wandworth Council will collect your Christmas tree if it's left outside with your rubbish on the usual collection day. Exact dates for 2019 are still to be confirmed so check back on the Wandsworth Council website nearer the time. The Smugglers Way (great name) reuse and recycling centre is another option. There's no kerbside collection service for Westminster residents. Instead, take your tree to one of the 26 drop-off points which are open from 29 December 2018 to 13 January 2019.